Formed in 1948, Air-Britain is a 3,000-strong worldwide community of aviation enthusiasts and historians. New members are always welcome. Although the subscription year begins in January, if you join later in the year you will receive back numbers of all the magazines you have included in your subscription. Options are also available for subscribers starting during the year for 9, 15, 18 or 21 months but if you wish to start from a month not shown in the options please contact us. There are three types of membership. 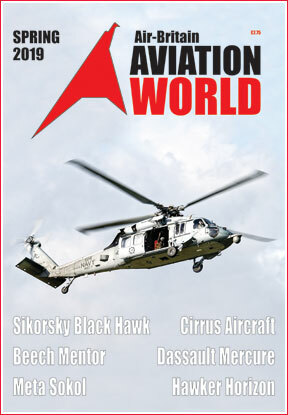 The ‘Historian’s Package’ gives you our Aviation World magazine. It is published in March, June, September and December. Glossy and profusely illustrated, it includes articles on all aspects of aviation, both current and historical. You can opt for the ‘Enthusiast’s Package’ to receive the monthly Air-Britain News, the leading monthly magazine for those who need trustworthy and detailed information about the current world aircraft scene. Each issue contains at least 164 pages – sometimes as many as 228 - crammed with airline and airliner news, the latest on Biz Jets and Biz Props, world register updates (our UK and US coverage is renowned), military aviation intelligence and UK airfield residents. This data is complemented by dozens of high-quality images from Air-Britain members around the globe. Air-Britain News is available in both print and digital editions. 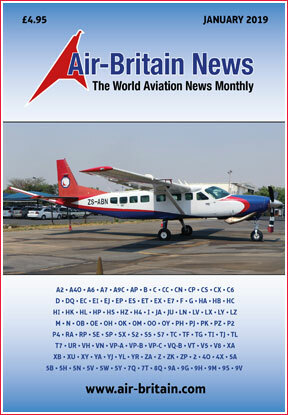 Finally there is the ‘Classic Package’ which gives you both the Aviation World and Air-Britain News magazines. Air-Britain maintains a substantial library of colour and black and white photographs and images, which are used for illustrating our books and magazines. We welcome donations. Air-Britain has gathered and published a vast amount of information. Many of our members are recognised experts in their fields. Some are happy to answer other members’ queries and a contact list of them is provided. We also have a members-only internet discussion forum, AB-IX. We operate a digital aviation photographic collection – www.abpic.co.uk - enabling both members and the public to submit their digital aviation photographs. With more than half a million images and growing daily, it is a valuable resource for both historians and enthusiasts. Air-Britain Travel organises tours for members and their immediate family from the UK to many areas. Apart from Western Europe and the continental USA, trips have been made recently to Alaska, Eastern Europe, South Africa and Australia. For many years, the Air-Britain Fly-In has attracted large numbers of aircraft, not only from the UK but also many European countries. The event is open to the public and access to the aircraft parking areas is enabled where possible. Currently the Fly-In is held at North Weald in Essex. A network of branches exists where members can meet fellow enthusiasts. Some provide a range of activities, including outings and websites. If you have any comments or questions, please contact our chairman, Malcolm Fillmore.